Mad Catz Company introduced a new modular gaming keyboard Mad Catz STRIKE 5. The main feature of this gaming keyboard is a modular design that allows the user to individually configure it to fit their anatomical characteristics and preferences. 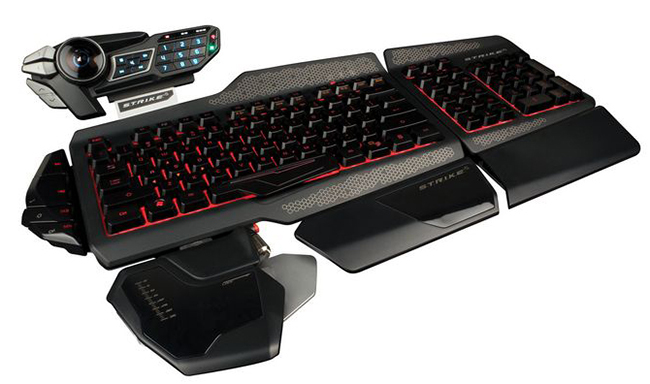 The main gaming keyboard Mad Catz STRIKE 5 unit is supplemented by special palm rest with the Action Button feature button and a scroll wheel Thumb Wheel. In addition, it is fixed touchscreen OLED-display EYE – this is another difference compared to earlier revealed STRIKE 7 keyboard, the last used screen VENOM digital block is a separate module, plus up to it and to the main keyboard can be connected wrist rest. There is a backlight, and its color is changed by the user with a wide range of EYE. In addition the display unit provides access to other functions, such as volume control, brightness, running games and applications, settings and select the macro. Gaming Keyboard Mad Catz STRIKE 5 is already available now for € 200.